Crowns are used for dental procedures in order strengthen the function of the tooth. They can also be used to restore the appearance of a tooth. Crowns are used to protect a weak tooth or fix a broken tooth as well. Dental crowns are used to strengthen a tooth that has a filling, to cover misshapen or discolored teeth and to make an aesthetic modification. Crowns may be used on primary teeth in children to save a tooth that has damaged by decay. Stainless steel crowns are often used in children. There are many different crowns available including stainless steel, metal (gold, platinum), resin, ceramic or porcelain-fused-to-metal. The cost of crowns depends on a variety of different factors including what state you live in. The experience and reputation of the dentist can also determine the price. The type of crowns selected will also greatly influence the price. Porcelain crowns are more expensive than gold crowns. 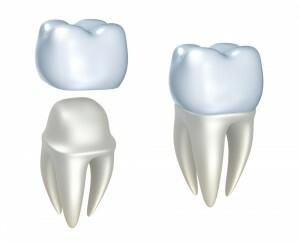 Some dental crowns are for temporary restoration including acrylic or stainless steel crowns. They can be fabricated in the dentist’s office. Permanent crowns are typically designed in a dental laboratory. The cost per crown is approximately $500 to $900. Some dental insurance companies will cover part or all of the cost, depending on the benefit package. If you require anesthetic the procedure will cost more. The procedure may require multiple visits to the dentist. Most often people have to go for two visits. The first visit involves preparing the tooth and getting X-rays taken. The X-ray will check the roots of the tooth receiving the crown. A root canal may need to be performed depending on the nature and extent of decay. The dentist will freeze the area around the tooth and the tissue in the surrounding gums. The tooth receiving the crown will be filed down. The dentist will either fill up the tooth based on damage, or file down the tooth to make room. After the tooth has been reshaped, putty will be used to create an impression of the tooth. The dentist will also create an impression of the mouth so that your bite will not be affected by the crown. The crown is then created at a dental lab based on the impressions. In roughly three weeks, your crown will be ready to be placed. The dentist will apply a temporary crown during the first visit. While you have a temporary crown it is important to exercise caution. Chewy, sticky foods should be avoided. Hard foods should also be avoided because they can dislodge or break the crown. At the second visit the dentist will remove the temporary crown. If everything looks acceptable the new crown will be permanently cemented into place. After the placement of the crown you may feel sensitivity and discomfort. If the crowned tooth has a nerve in it you may experience heat and cold sensitivity. The dentist will recommend toothpaste designed for sensitivity. If you experience pain and sensitivity when eating and talking the crown may have been placed incorrectly. The dentist will be able to solve this issue easily. A crown may become loose, which can allow for bacteria to leak in and cause decay. The crown can also fall off, which is usually due to an improper fit or lack of dental adhesive used. The crown can be replaced using dental adhesive, but this is only a temporary solution. Usually this is due to improper fit or not enough adhesive being used. If this happens, clean the crown and the front of the tooth. Make sure that you contact your dentist as soon as possible to avoid any further damage. He or she will give you instructions on how take proper care for your new crown. Your dentist may re-cement the crown in place if possible. If this is not possible a new crown will be made. An allergic reaction to the metals or porcelain used in crowns can occur, but this is extremely rare. Dental crowns often last five to fifteen years based on proper care. The longevity of a crown depends on the amount of physical stress the crown is put through. It is very important to exercise complete oral hygiene practices. You should brush your teeth at least trice a day. Flossing and mouthwash also benefit the mouth by killing germs and plaque. Exert caution when brushing around your new crown to avoid harm. Antibacterial mouth rinse can also help provide a complete oral care routine.